Woodberry, Hampden, and Stone Hill are all neighborhoods that grew up in service of the grain and textile mills along the Jones Falls. According to a neat timeline compiled by the folks over at Rotating History, the Jones Falls were first settled by David Jones in 1661. At that time, the river was "deep enough to drown a man", which I take to be 6 or 7 feet. Since it is now dammed at Lake Roland, the downstream part of the falls is little more than a foot deep in most places, and about thirty feet across. Around the time of the Revolution, grain mills sprung up on the banks, taking advantage of the water power. In time, these turned to textile mills, and the neighborhood was an economic driver of early Baltimore from about 1800 until the end of WWI. The Second World War renewed the cotton industry for a time, but that faded quickly post-war and the mills were largely abandoned. They then followed the familiar cycle of urban renewal -- colonized by artists and craftsmen, then developers. Some burned or fell down before that could happen. The eponymous falls, as they exist today, concreted into a semi-circular drop beyond the aqueduct. Walking down the Jones Falls bike trail, I felt like I had slipped into a post-apocalyptic future or a pre-industrial past. Traffic was infrequent, in mid-day, the hum of engines replaced with cicada buzz and faintly rushing water. Bikers shot by, nearly silently, picking up speed on the long downhill. Trains passed, somewhere in a thicket of trees and kudzu, the tracks giving off an eerie, dog-whistle signature. I recorded it on my phone, and humbly suggest you listen back to it as you read, for a heightened multi-sensory experience. The recording is unedited, save a little background noise removal. I veered off of the paved trail in search of the river several times. 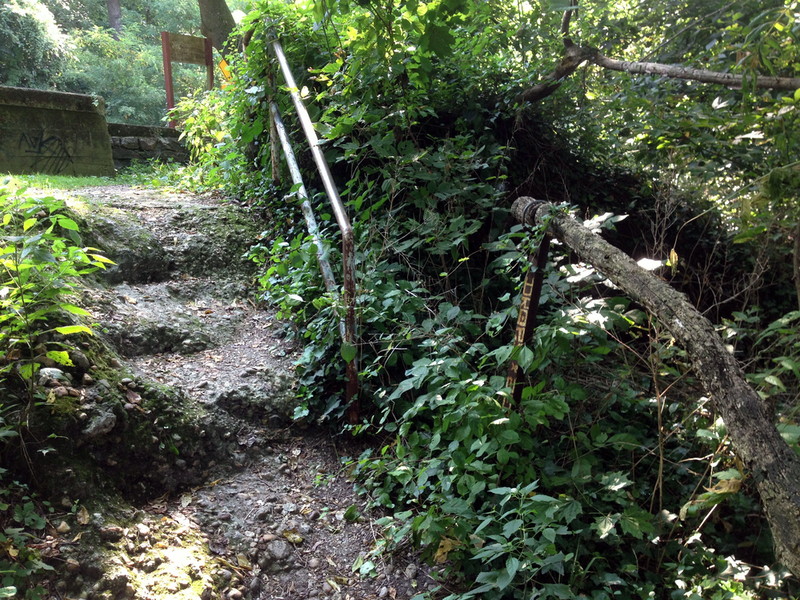 The first turn led down some crumbled concrete stairs, guarded with a kind of woodpunk handrail made of gnarled tree branches and welded bits of scrap. Halfway down, I saw a platform through the trees, overlooking the falls. However, someone was sleeping down there, so I respected his space and turned back. A few hundred yards south I discovered another hobo encampment, little more than a bed of newspapers behind a fallen log. Completely hidden from the road, it was only betrayed by a faint dirt path leading up. 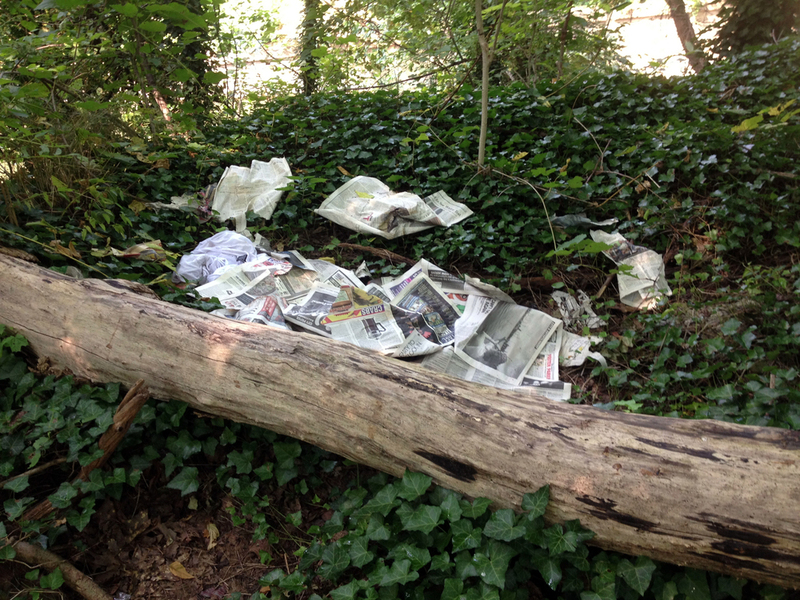 The newspapers were fresh and dry, evidence of recent use. Nice bracket detail; able to accommodate anything round-ish. From the road, said hobo was safe from view, though the dirt path was pretty obvious. Use a different route every time . . .
My next attempt down to the water was successful. The Jones Falls once accepted a lot of sewage, and still does whenever there is torrential rain. Various storm drains empty right into the water, dank toothless mouths back into the darkness. The bank represented an urban strata: asphalt, brick, and concrete, mixed up with quartz, granite, sandstone, and some remarkable hunks of flaky mica. Up against the retaining wall was hobo camp number two, consisting of a low stone wall, two fire pits, and a pile of neatly split wood. It looked as though it may have been a drinking spot for high schoolers, but the lack of fresh trash and beer bottles suggested it may have been a more serious camp. The rocks would be rough for sleeping, but it was protected from the road, with an easy escape route and a nice straight wall to ease your back against. I mean, that shot is straight out of National friggin' Geographic! Geological sample of the beach. Not including trash, quite a diverse array. Hobo camp #2: kids or campers? Soon after, I passed the monumental roundhouse that serves some of Baltimore's snow plows. The garages were open in the heat, revealing calcified drifts of salt, tinged blue at the bottom like some sort of marooned glaciers. Just to the south was an abandoned truss railroad bridge, overgrown completely. I could hear a train at this point, but could not see it, nor any other person; for a few minutes it was a waking dream, my senses delivering conflicting information. Apologies for the crummy picture, the sun was coming straight into the camera. Past the dead bridge is the Baltimore Streetcar Museum, a heap of rusting anachronisms. It brought the post-apocalyptic vibe into sharper focus, walking through a graveyard of once-monumental technology, trains that once ferried my grandfather to work, now decaying back into the river that first birthed this city. Graffiti on the museum's unused warehouse. Surprised no enterprising scrapper has taken a torch to these things yet. The cockpit of a dead streetcar, handrail and all. Beyond that, I wound down, walking under one last bridge, spying one last encampment, making off with one more dumpster find. I won't post a picture of that last hobo site, because someone was in it, and I respect their privacy. This particular transect, short as it was, gave me some particularly powerful cues about this town. It rose from industry, it has largely failed because of industry, and it faces a future that may look something like Detropia -- inhabited by artists and scavengers and hobos and farmers and dreamers and gleaners and guerillas of all kinds, scrabbling forwards. Strapped to the back for the walk home.